Hi Minerva crafters, first of all, I would like to wish you a happy new year, hope you had a great time during holidays and best wishes for 2019! First post of the year here on the Minerva Crafts Blogger Network and I couldn't be happier with what I made for this month. 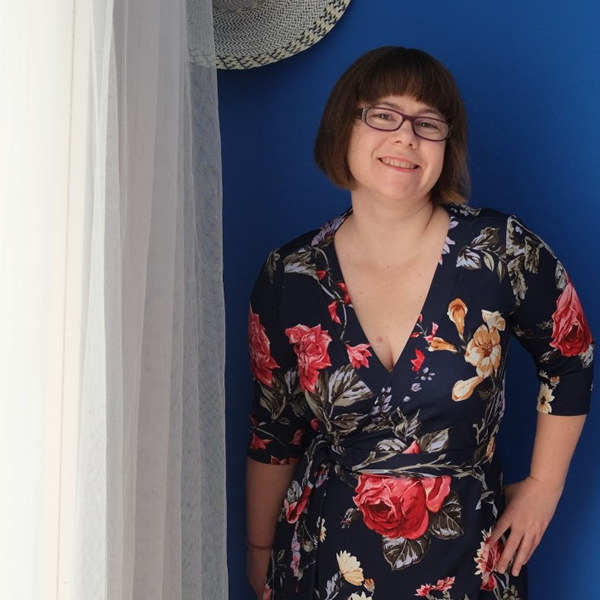 I chose a Rachel Comey pattern as all these years I've been sewing I've read great reviews for this designer's patterns and they all look like very feminine patterns! I went for Vogue 1408 that as described on the envelope it is close fitting through the bust dress, partially lined, left back extended into yoke front with no left side shoulder seam, gathered sides and back, back godet, bias armhole and underarm binding, invisible back and sleeve zipper and narrow hem. As you can see there are quite a few special details in this pattern and the design looks very flattering! My favorite features on this design are the front neckline and the gatherers. The fabric I chose for this dress is a Viscose Crepe from Ateliere Brunette in black color and viscose lining. This crepe is so perfect for this dress as it drapes beautifully and is quite thin so all the gatherers around the waistline do not add any extra bulk, it definitely requires a lining though as it is quite see-through! The construction of this pattern is not that difficult as I thought it was, there are all these details and steps to achieve the desired result but the instructions are very detailed and it proofed out to be fairly easy and I faced no problem while I was putting all the pieces together. I only had the front neckline that is slightly cut on the bias , stretched a bit so I had some gaping there, I addressed it by making some gathers on one side and I think this design feature is in harmony with the rest of the design as there are gathers in other parts of the dress as well. If I make it again I will have to stabilize the area somehow to avoid stretching it. One thing that I didn't like about this pattern is that in the finished measurements they mention only hem width and the length from the neck to the hem, now I really don't understand why they consider the width of the hem so important and the bust or hips measurements they don't even mention, to determine my size I measured the pattern pieces and I concluded in size 16, one size smaller than if I had chosen the size based on the body measurements. The length of the dress was useful however because it said that for my size the length is 1.24 m which would hit me right on my ankle, I wanted my dress just under the knee so I had to shorten it quite a bit. Now, why as the sizes go up the designer has also increased the length of the dress I don't know, the length starts from 1.21 m for size 6 and goes up to 1.26 m for size 22, If only I got taller as I gain weight, that would be awesome if it happened, anyway! The last thing that I want to mention is the fact that I made the dress sleeveless, the pattern has a great feature on the sleeves as well, there are zippers on both sleeves and I really love this detail, however when I attached the back zipper and tried the dress to see how it fits I really liked how it looked without the sleeves, I had already cut the sleeves but I want to keep the dress sleeveless, at least for a while and were it like this, maybe later I decide to add the sleeves but I'm not sure yet. For now, the armhole is finished with bias binding and it looks great as is! The Merchant and Mills Blouse!